R-Value is a very accurate and reliable expression of how insulation materials perform with regard to conduction of energy in a laboratory apparatus. But people don't live in laboratories or only deal with the conduction of energy. They live in homes with real walls and ceilings, and in the real world of buildings R-Value is only one factor which determines the actual performance of insulated building assemblies. The truth is…not all insulations effectively combat all three kinds of heat transfer. Unlike other insulations, Applegate Insulation effectively combats all three kinds of heat transfer. Applegate Insulation with an R-Value of up to 3.8 per inch, can be installed as a dense monolithic block in walls and as a blanket in the attic which significantly reduces air infiltration and acts as an effective barrier to heat transfer. Whether your home was built a century ago or completed yesterday, it’s not too late for you to enjoy the benefits of Applegate Insulation. Covering old low-density loose-fill fiberglass in an attic with more of the same stuff “fails to restore the lost R-Value” that naturally occurs with fiberglass. 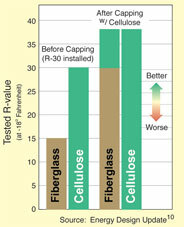 But researchers at Oak Ridge found that when one “cap” loose-fill fiberglass with cellulose, it not only adds R-Value, it actually restores the effective R-Value that fiberglass loses during cold weather. Many older homes were built with little or no insulation in the sidewalls. Your local Applegate installer can add Applegate Insulation to your existing home’s sidewalls, making your home more energy efficient — saving you money! How much Applegate Insulation you should have in your home will vary based on what type of climate you live in, the construction of your home, what heating equipment you are using and what type of fuel your heating system uses. The U.S. Department of Energy has put together some recommendations for minimum R-Values based on where you live in the United States.